I recently read this post on one of my favorite blogs and drew inspiration from it! Today I am 35! That number seemed so far away once. 30 seemed so far away once, and here we are 5 years later. Older, a little wiser, a lot more tired! But today instead of necessarily reflecting on the years, I am going to share 35 essentials at 35 years I think are both fun and necessary! Some are splurges, some are actual things I can’t live without, and some are just FUN! 1.-3. Facemasks! I am a firm believer in skincare. I think it’s one of the MOST important things we can do for ourselves. I would hate to look back 10 years from now and wish I had started then. I have so many it’s borderline ridiculous, but alas it is my job. My favorites are this one from Tata Harper, this one from first aid beauty, these eye patches (they count) from Peter Thomas Roth. 4. This trench/raincoat I absolutely splurged on. I got my 2nd hand on Poshmark but I am obsessed. It’s classic and will never go out of style so I think it’s worth the price tag. 6. Jeans you feel great in. My favorites are from Madewell. They are SO flattering and I am not even a jeans person. 7. Slippers that you love. 8-9 Rollers. I love my ice roller and my jade roller and use them both nonstop. 10. GOOD shampoo and conditioner. 11. AirPods. I honestly didn’t think I would love them as much as I do but they are the best. 12-15 Handbags. A classic tote style handbag that you will still love 6 years later. I got this 6 years ago and still wear it nonstop! A crossbody handbag that never goes out of style. An everyday tote with a monogram. A splurge handbag that you hope doesn’t’ go out of style because you love it hard. 16. THE BEST LEGGINGS EVER. 17. A bronzer that is 100% worth the price tag. 18. A bronzer that is more budget friendly but just as good. 21. A puffer coat for the colder days. 22. Super luxe pajamas that make you feel incredible. 23. Silk pillowcase worth it! 24. Scrunchies also silk also worth it. 25. The best joggers for home and for being out and about. 27. What my mom refers to as “hospital shoes” — don’t care still love them. 31. A razor subscription( I am obsessed-not sponsored). 33. Best yoga mat ever. 35. Ride or die sunglasses. I am spending my birthday having lunch with my mama, and dinner with my boys and there is nothing else I would rather be doing! 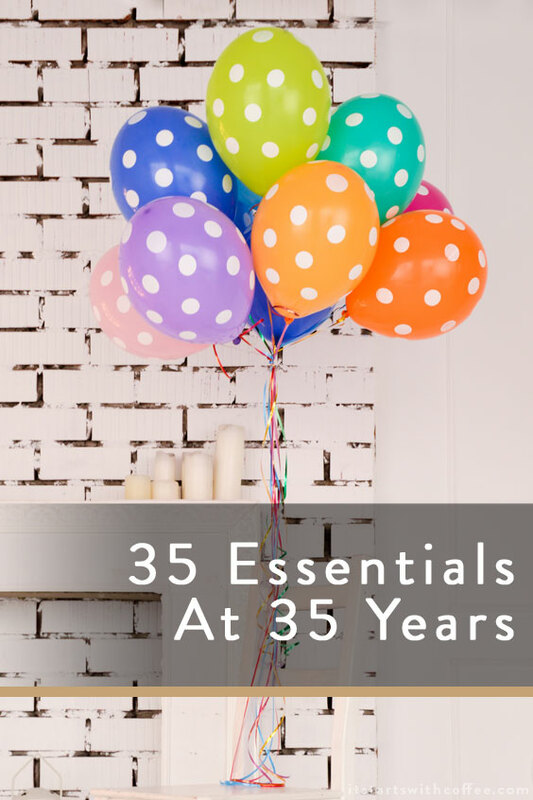 I hope you all have a great day and enjoy my 35 essentials at 35 years! Happy Birthday girl! It’s mine today too! I love the idea of this post. I just bought a rose quartz roller to see what all the fuss is about for myself. LOVE truth serum from PTR! Happy “35th” Birthday! Those things that make us feel our best should always be essential. I’ve noticed that as I’ve gotten older, my list changes too. Hooray for jeans, leggings, lipgloss, and sunglasses. I’d have to add a daily vitamin and sunscreen to my list. Love this! Talking about skincare, my husband always tells me that he wishes he had started early like I did so he wouldn’t look so much older than me! Lol. Thanks for sharing this list of essentials! Facemasks are definitely on my list. And I need to invest in silk pajamas and pillow cases! Happy Birthday! I hope you have a wonderful lunch with your momma and your guys spoil you at dinner tonight. There are some things I’ve learned to need in my 30s, too. I love this list! Happy Birthday! I hope you had a wonderful day. I love this list and will be picking up a few of these things for myself. definitely sunglasses haha! This is a great list, thanks for sharing. So many bodies here! I agree those Lululemon are the best leggings. I’ll have to try the Outoor Voices joggers! Happy birthday 🙂 Out of your whole list, if I could choose just one item, it would definitely be the slippers. I can’t stand closed shoes in the summer! Such a great list and a great idea! I will turn 50 this year and this would be fun! Hope you had a super day. Thanks for sharing Such a great list and a great idea! I am also not really a jeans person but definitely have my favorite pair. This is a great list!